Living in Western Canada all my life didn't provide much opportunity to see a real castle first hand. It wasn't until I was sixteen, when my father took me to Italy to visit his aunt in Trieste that I got my chance. My father's cousin, Romano, a police officer in Trieste, took the day off and took us to Castello Miramare. 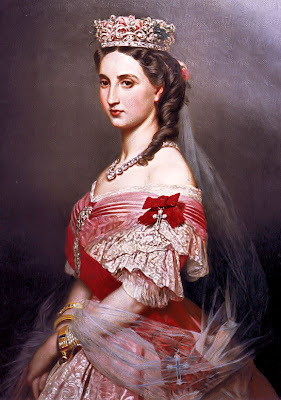 I fell instantly in love with it and have never forgotten how mesmerized I was with it's enchanting beauty and the tragic love story between Maximillian and his Queen Charlotte of Belgium. 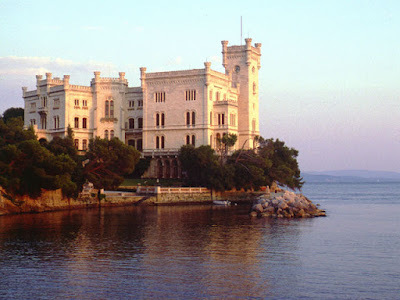 Ferdinand Maximilian (1832-1867), of the House of Habsburg - younger brother of Franz Joseph, Emperor of Austria - built the beautiful castle wich sits on the Gulf of Trieste. Maximilian originally came to Trieste in 1850 when he was eighteen years old with his brother Charles. According to legend, he was forced to take shelter in the harbour of Grignano when caught in a sudden storm. It was then that he chose that bare rocky spur of limestone origin as the setting for his home. He wanted to name it Miramar after the name of Prince Ferdinand of Saxony’s residence in Pena, Portugal. When he approved the plans, he insisted on creating an intimate atmosphere in the area reserved for his family – an area which he wanted to be in contact with nature, reflecting both his own spirit and that of an epoch. 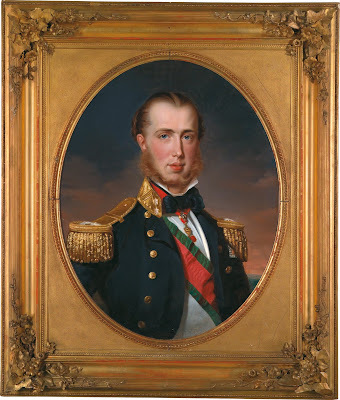 The work, steadily supervised by Maximilian, was finished only after his departure in 1864 for Mexico where he was appointed Emperor, and where after a brief reign he was shot in Querétaro in June 1867. 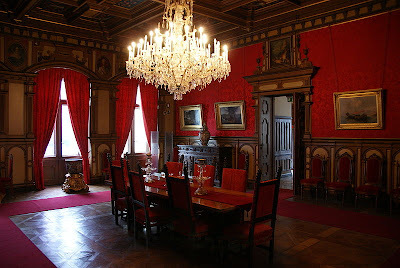 Currently, the rooms in the Castle are mostly arranged according to the original layout decided upon by the royal couple. A valuable photographic reportage commissioned by the Archduke himself made accurate reconstruction possible. Nowadays to visit the Castle is to experience the fascination of life in the middle of the 19th century in a residence that has remained largely intact. During the construction, he had a small castle called the Gartenhuys or Castelletto built. It was a smaller replica of the main castle and he lived there until Christmas 1860. The Castelletto, situated in a panoramic area, faces Grignano on one side and on the other a parterre surrounded by trees and on a clearing in front of greenhouses at the centre of which there is a fountain. 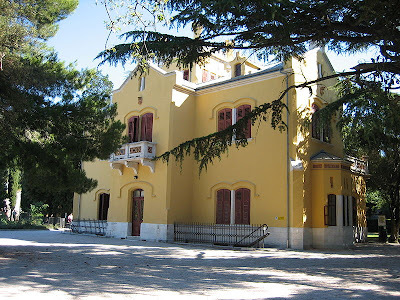 The Castelletto is closely linked to the tragic history of Maximilian and Charlotte. It was here that Charlotte stayed upon her return from Mexico with a nervous breakdown, between the end of 1866 and the beginning of 1867, while awaiting her return to Belgium. 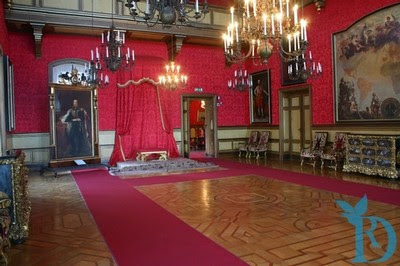 It also housed part of the furnishings of the Castle of Miramare during the period when the Duke of Aosta stayed there. Today, visitors are permitted to view Maximilian's and Charlotte's chambers and various other rooms. All the rooms still feature the original furnishings, ornaments, furniture and objects dating back to the middle of the 19th century. Particularly noteworthy are the music room where Charlotte used to play the fortepiano, now on show in room VII. In room XIX there are a series of paintings by Cesare dell'Acqua depicting the history of Miramare. 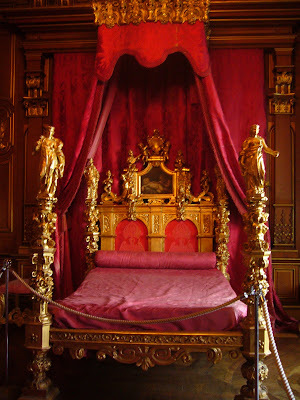 Lastly, visitors may visit the throne room, which was recently restored to its former splendor. It must have been such a special trip for you visiting Italy for the first time. Gorgeous -- must be amazing to see in person. Lovely post -- thank you for sharing!